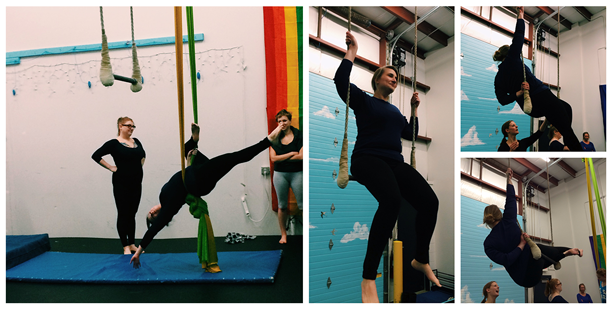 Once a month they offer an aerial sampler class for beginners where you get to try the silks, trapeze and the lyra. It’s a fun way to spend a Friday evening for anyone who isn’t put off by having to sign a death and injury waiver. My favorite portion of the class was the silks, mostly because you’re only a couple feet off the ground, plus we started out on them, so my biceps had not yet become fatigued to the point of failure. It’s also the portion of the class where it is easiest to fake elegance. This entry was posted in Ann Arbor, Life and tagged Ann Arbor Aviary. Bookmark the permalink.